The Indian Army List is a great resource to use to research not only British and Indian officers who served in the Indian Army but officers who served in British units in India. The list was published quarterly from October 1889 to January 1942, apart from a brief period between September 1901 and June 1902 when it was issued monthly. After January 1942, it was published biannually. When researching an individual who appears in the Indian Army List, the best practice is not to consult a single volume but to try and view as many as possible over their years of service. If you were researching an officer who served for fifteen years in an Indian regiment and you only looked at five or six Indian Army Lists, you could easily miss key information. 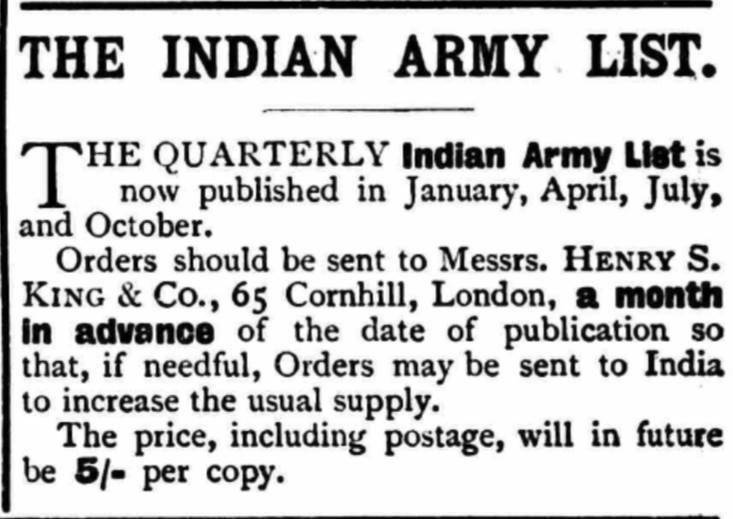 Below is an advert for the Indian Army List taken from the Homeward Mail from India, China and the East 29 May 1910. The Homeward Mail is a very good resource to use when researching British officers of this period, especially for information regarding their passages to and from India, and is available to view on FindmyPast. A number of volumes of the Indian Army List are now available to download/view from the Digital Library of India. The files are large PDF (some are well over 500MB) and may take a while to download depending on your Internet speed. The link below will take you to the Families in British India Society website, where the available Indian Army List are arranged in tables by year. Click on the date you would like (the blue text). You will then be taken to the Digital Library of India’s website, where you will need to click on either View Book on FlexPaper, or Open/Download. The best place to view hard copies of the Indian Army List is in the Asian and African Studies Reading Room on the third floor of the British Library. Not only is the British Library conveniently located next to Kings Cross St.Pancras, but it also has an extensive, well-bound collection on open access inside the Asian and African Reading Room. However, you will need a reader’s pass to view the collection: How to get a Reader Pass. If the volume you require isn’t on the shelf, then you can order it from the online catalogue. 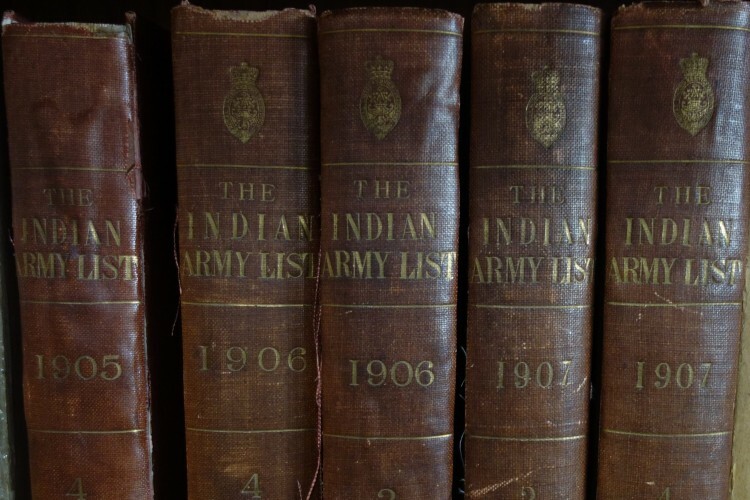 There are 219 volumes of the Indian Army List available to order with their catalogue numbers running between IOR/L/MIL/17/5/1 and IOR/L/MIL/17/5/219. If you click on the blue links, click “Browse this collection” to see the individual volumes. The photograph below shows a section of Indian Army Lists available at the National Archives. The National Archives doesn’t have a great selection compared the British Library, however, you don’t need a reader’s ticket to view them. Only a single Indian Army List has been reprinted which isn’t currently available to view online. This is the January 1919 Indian Army List which was reprinted as a four-volume set by the Naval and Military Press in 2001. It’s an expensive set but you can sometimes pick up a cheap second-hand copy off eBay or Amazon. Original Indian Army Lists seldom come onto the market and when they do, tend to command high prices. The first place to start when using an Indian Army List is with the index, as officers often appear on more than one page. Where a regiment was stationed is a crucial piece of data and should not be overlooked. Once you know where an officer served in India, you can start to explore the history of the region and see if his service overlaps with any important events in the area. Below is an extract from the July 1918 Indian Army List which lists the British officers attached to the 74th Punjabis. The first column recorded the date of an officer’s first commission and the second their name. You can find out a full name by looking at an officer’s entry at the start of the list. Take note of the officer’s commission date as often the officer isn’t on the page he should be and if you’ll have to use his commission date to find him. 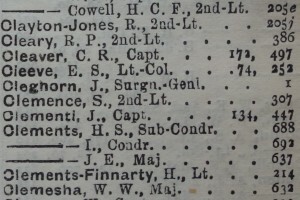 The third column recorded when the officer was promoted to that rank, the fourth when he was appointed to the unit and the last column is for any remarks. I’ve written a list of common Indian Army abbreviations and acronyms which will help you to decipher the jargon found in the Indian Army Lists: Indian Army Abbreviations and Acronyms. For Indian officers the same information was recorded except you will often find numbers in brackets after the end of their names. These brackets refer to training courses passed and you’ll find a complete list at the start of the book. The senior Indian officers of the 75th Carnatic Infantry are shown below. N-W.Frontier of India, Waziristan, 1901-02- Medal with clasp. Tibet – 1903-04. Action at Naini, 26 June 1904. Operations at and around Gyantse, between Lhassa, 14 July to 3 August 1904 – Medal with clasp. If you are researching either a British or Indian officer who served in the First World War, try to get the latest war service statement you can find. The war service statements shortly after the war record very little detail while the later issues often give the exact dates and theatres of war served in. 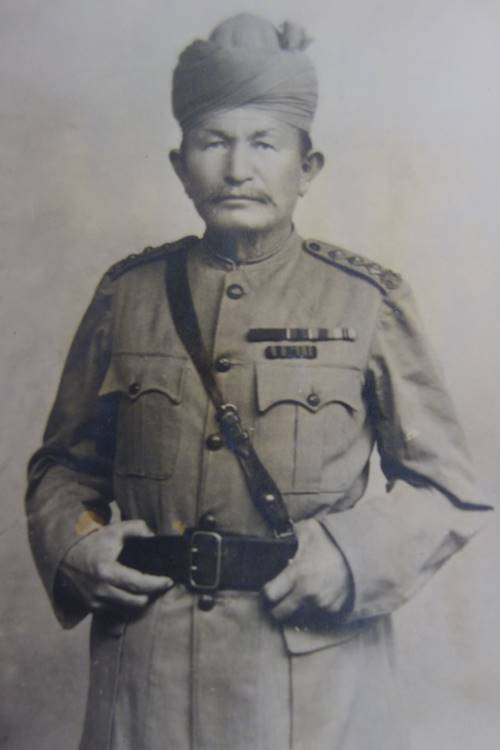 The officer is Honorary Captain Dost Muhammad OBI IDSM, who was Subadar-Major of the 106th Hazara Pioneers between 1904 and 1917. Dost Muhammad was a very distinguished officer and his war service statement below was taken from the January 1914 Indian Army List. If you are researching a soldier who served in the First World War click on the photograph below to learn more about the research service I offer.